Does anyone have experience repairing a dead MIDI OUT on an Ensoniq ESQ1? I have a 'plastic' model. I've just recently replaced the battery and updated the OS. Everything works fine. However MIDI OUT appears to be dead. MIDI IN does work. I've inspected the main board and see no visible signs of damage. There is another minor issue I have that may (or may not) be related to the dead MIDI OUT. When I move the modulation wheel to its maximum position, it appears to affect the data slider. Or at least the AD converted that samples the data slider. Its more noticeable when I focus on a parameter, filter cutoff for example, when I move the modulation near its max, the cutoff value will jump around, as if I nudged on the data slider. Does anyone have any additional insight into these issues? 1) check MIDI menu to be sure it's on the right channel, turned ON etc. This gives me hope. I will check this out. While you check that, be sure to check the solder joints/traces where the jack is soldered onto the mainboard. I've made a couple of test without taking the synth apart. 1) MIDI setting are where they should be. 2) I'm getting +5 pm pin 4. Seems good. 3) That would be Q5 (according to schematics). I'm not sure how to test it. I have an oscilloscope but I'm waiting for better probes. Mine are shot. Should I test Q5 transistor on the board? While its turned on? And, can you suggest a testing method? 4) I don't believe this is an issue but Ill look carefully when I have the board out. pmanderson wrote: [3) That would be Q5 (according to schematics). I'm not sure how to test it. I have an oscilloscope but I'm waiting for better probes. Mine are shot. Should I test Q5 transistor on the board? While its turned on? And, can you suggest a testing method? If there are pulses there and not at the jack, (SEE NOTE)suspect the transistor. If there are NO pulses comming from the DUART, then there is deeper trouble. NOTE: the MIDI is a current loop, so to see pulses at the jack, you will need a cable connected and plugged into a working (powered up) MIDI IN port on something else. EDIT: Another long shot: If there are no pulses at the base of the xsistor, try re-seating the DUART chip - if socketed. I believe the 2N3906 type is what I need. Can you recommend one from the list above? I'll also be ordered 2 312-319BF-5K slide pots as well. I'd go with the first on the list. They look like they might fit, but the shaft may be too thick for the original knobs. More expensive, but their parts are first class quality and perfect fit. 1) I unscrewed the assembly out and removed the wheel from the pot that controls the modulation; leaving the pitch-bend wheel alone. 3) Then I adjusted the mod-wheel pot with my hand until it read exactly the same, 4.32k. 4) Put the wheel back on the modulation pot; making sure it was centered like the pitch wheel. 5) Plugged it back in, turned it on. The issue is gone. The problem doesn't show itself in the analog test procedure either. 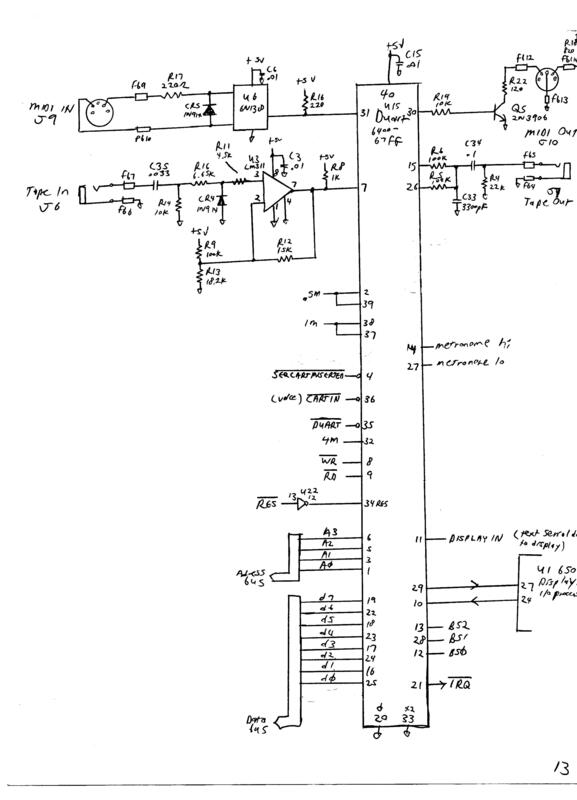 After looking carefully at the ESQ1 schematic at the buchty site, I was convinced I could remove the motherboard and positively test for a bad transistor. However once I started inspecting the motherboard carefully, I realized the schematics did not match what was on the board. The labels for the components for MIDI out (and everything else) did not reflect that what was on the motherboard. These ESQ-1 schematics did not match my board. However, the labels on the SQ-80 schematics for the MIDI OUT components match exactly what I was tracing in my ESQ-1 board. I tried to compare my motherboard with other photos of ESQ-1 motherboards and I can see the difference. My board is labeled "Assembly ... revision J"
So the suspect transistor is NOT Q5, its Q1. I used my multimeter's diode test and was able to see it was passing current from collector to emitter with power off. I believe that should not happen. I will attempt to pull the transistor out tomorrow (Saturday) and replace it with a new. Just part of the fun of vintage synths! "Let's make a production change, but updating the schematic is too much work...Who'll ever know?" After replacing the Q1 transistor the MIDI out is still not working. At least I worked out a solution for the modulation wheel issue. Thanks for your input rhino. Well, to paraphrase an old dirty joke: "You don't get the easy one...". Time to borrow a scope and check the output of the DUART chip - pin #30. From personal experence, recheck all traces and solder joints again - and again!